Suhaib Webb is an American Muslim imam who is currently the imam of the Islamic Society of Boston Cultural Center (ISBCC). Mustafa Cerić ([mustafaː tserit͡ɕ], born 5 February 1952) is a Bosniak politician who served as the reis-ul-ulema of Bosnia and Herzegovina and currently president of the World Bosniak Congress. Abdul Wahid Pedersen (born Reino Arild Pedersen in 1954) is a Danish Imam. Sheikh Ahmad bin Hamad Al-Khalili (Arabic: أحمد بن حمد الخليلي‎) (born 1942) is the Grand Mufti of the Sultanate of Oman. 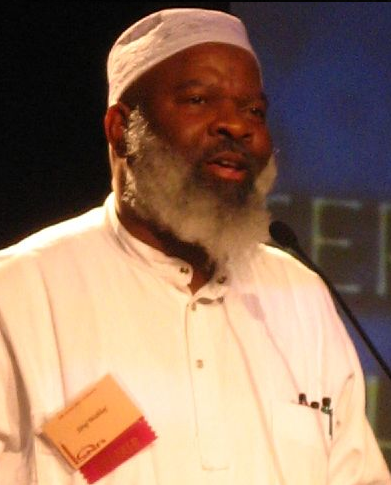 Siraj Wahhaj (born Jeffrey Kearse, March 11, 1950) is an African-American imam of Al-Taqwa mosque in Brooklyn, New York and the leader of The Muslim Alliance in North America (MANA).